Did You Know You Can Subscribe to Twitch Prime For Free? Beyond donations, subscriptions are one of the most-popular ways for viewers to support their favorite Twitch streamers. They not only give the streamer a recurring source of income but they also give the subscriber a variety of digital rewards such as new emotes, badges, an ad-free viewing experience, and access to exclusive subscriber-only Twitch chatrooms. While Twitch subscriptions begin at $4.99 a month (with $9.99 and $24.99 tiers also being available), there's actually a way to unlock a free subscription option through the Amazon Prime or Twitch Prime services which can be used in the same way as the paid version and also provides all of the extra benefits. Here's how to use a free Twitch subscription. A Twitch subscription is a recurring payment made to individual channels on the Twitch streaming service. Its primary purpose is to support streamers financially so that they can stream content more often or even transition to streaming on Twitch full-time. Subscribers are rewarded for their support with an increased status in that channel's chat room in the form of new emotes and other digital goods. Amazon Prime is a premium paid subscription service provided by Amazon that gives subscribers access to the company's large library of TV shows, movies, books, and songs in their Prime Video, Prime Music, and Prime Reading programs respectively. In addition to streaming media, Amazon Prime subscribers also gain unlimited cloud storage, discounted shipping on Amazon purchases, limited access to Audible, and a Twitch Prime membership which offers monthly rewards, ad-free viewing on Twitch, and a free Twitch monthly subscription among other benefits. Are Amazon Prime and Twitch Prime Different? 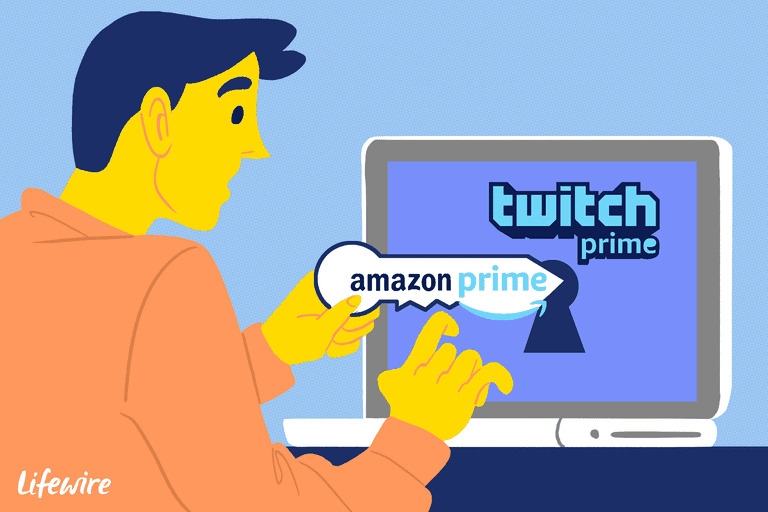 Twitch Prime and Amazon Prime are technically different programs however subscribing to one automatically unlocks a subscription to the other. One can also interpret Twitch Prime as being a part of Amazon Prime in much the same way Amazon Video is. Amazon Prime is the umbrella under which all of the company's other Prime programs (such as Twitch Prime) are run. After logging into your Amazon account on the Amazon website, navigate to the official Amazon Prime page and click on the yellow button that says Start your 30-date Prime free trial. The website will then confirm that you want to start your one-month free trial of the program. After this period has ended, your chosen payment method will be charged the usual $10.99 a month fee. Make sure to connect your Amazon and Twitch accounts before signing up with Amazon Prime. Also, if you already are an Amazon Prime subscriber, all you need to do is link your Twitch account to your Amazon account to unlock Twitch Prime. You don't need separate Amazon Prime subscriptions for your Amazon and Twitch accounts. Connecting your Twitch and Amazon accounts is necessary to unlock Twitch Prime and also to use paid features such bits (cheers). Here's how to do it. Make sure you're logged in to both your Amazon and Twitch accounts within the same web browser. Click on the Connect your Twitch account link on this page here. Follow the shown instructions and click the purple Confirm button. Your accounts should now be connected. Your Twitch and Amazon accounts only need to be linked once. As soon as it's done, the connection will work across other devices where you use Twitch such as on the Xbox One or iPhone. Open a web browser on a computer and navigate to the Twitch channel you wish to subscribe to. In the top-right corner of the screen, or below the video to the right, there is a purple Subscribe button. Click it. Once clicked, a small box containing a variety of subscription options should appear. Click the Subscribe Free button to begin your free Twitch subscription for this channel. Unlike paid Twitch subscriptions, the free one does not automatically renew each month. Free subscriptions must be renewed manually. Since the free Twitch subscriptions don't automatically renew on their own, you will need to visit your chosen channel in a web browser again and manually re-subscribe every 30 days. The process is identical to the way one would subscribe to a channel for the first time. Your subscription streak will continue as long as the subscription to the same account is renewed within 30 days of its expiration. To cancel your free subscription, simply wait for the end of the current 30-day subscription period. After the 30 days are up, the subscription will expire and it will be free to use on any other Twitch channel which has subscriptions enabled (i.e. Twitch Affiliates and Partners). Users on Twitch can switch from a paid subscription to their free subscription option without breaking their subscription streak on a channel. Here's how to do it. To the far right of your chosen channel's profile will be a purple button called Payment info. Click on it. Click on Don't Renew to cancel your subscription. You subscription will remain active for the remainder of the current subscription month but will cease working the day after the final day. After your paid subscription has expired, subscribe to the same channel with your free option as per usual. Your free subscription will take over from the paid subscription if it is activated within 30 days of the previous subscription's last active day. How Much Money Does the Streamer Get? The free Twitch subscription provided by Twitch/Amazon Prime is only valued at $4.99, the lowest subscription tier. This subscription functions exactly the same way as it would if you paid for it out of your own pocket so the streamer receives 50 percent of the total donation fee, around $2.50, and Twitch keeps the rest.